Tomorrow is the fourth week of the Lodger reverse auctions – where a pair of shoes falls in price by £2 a minute, and anyone can win them at the current price just by picking up the phone. It’s a game of nerves. So far a pair of Kudu boots has gone for £233 (down from £415), a pair of wrapped oxfords has gone for £104 (down from £500) and some almond slip-ons went for £115 (down from £375). So pretty good discounts all round. Tomorrow it’s the turn of the tobacco slip-ons above in sizes 6, 7, 8.5, 11, 11.5, 12, and 12.5. The auction starts at 3pm to let our friends in the US take part. Eighty-four people are signed up to watch the auction already. 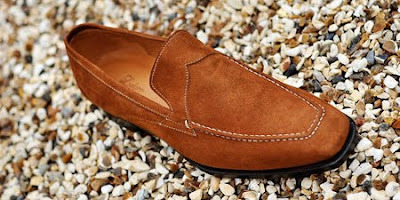 To join them, go to Twitter and search for LodgerFootwear. I love this unique way to bargain hunt. Not sure my nerves can stand it though. You can follow the discussion on Lodger reverse auction update by entering your email address in the box below. You will then receive an email every time a new comment is added. These will also contain a link to a page where you can stop the alerts, and remove all of your related data from the site.